Where was I? 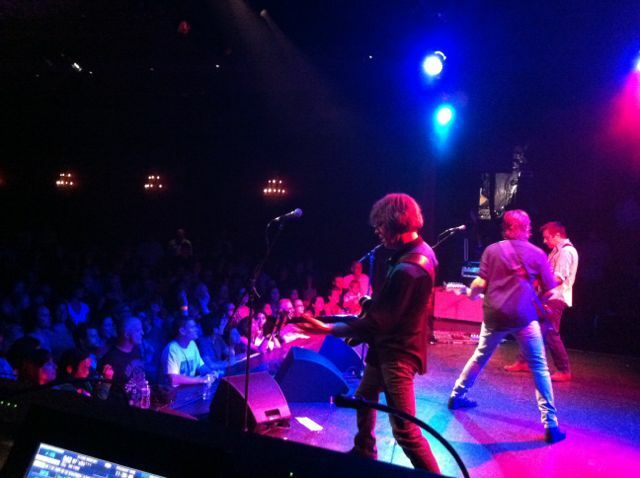 Oh yeah, I was back at the El Rey, for the second night of Old 97's Too Far to Care anniversary tour. I get there before will call opens, so I have to wait a while (I am, again, first in line, like a goober). I'm standing around just messing with my phone when, hello, Ken walks out of the entrance and comes over to talk to me, constituting Surreal Moment Number One. I think he must have seen me on his way in a few minutes earlier or something, and recognized me from the night before. Probably realized he could make a fangirl's day week month, by taking a moment to say hi. Anyway, he's super friendly and chats me up a bit, right smack in front of about fifteen other fans. He's even remembered my name. I feel incredibly cool. At this point, some of the sound guys I'd met the night before come by on their way to grab a quick bite before the show. They invite me to go with them, but I don't want to give up my spot. The one who'd hooked us up the night before laughs and says, "I don't think you'll have a problem getting back in early." Sweet. I tag along and have a drink while they eat dinner at El Toro. We talk about - what else? - music. And the merits/dangers of hot sauce. And my dog, whom they decide looks like Fred Gwynne. We finish and walk back, and - very rockstar moment for me - I get to walk right in with them, past everyone still in line, even though doors haven't opened. I'm just getting settled for my wait near the stage when my sound buddy comes over and outfits me with a grey wristband. "Come with me," he says. We walk past security, through a short hallway that lights up when we enter. "It's on a sensor," he explains, "so don't get scared when you come back later and it does that." I follow him up the steps onto the stage, and he ushers me to the stage left wing where the huge sound board sits, just a few feet away from the microphone stands. "Anytime you get bored during the concert, just show that security guy your wristband, and you can come watch from right here." I stare at him. He laughs. "I'll be right here the whole time. Come up whenever you want. Just be careful, because it's dark. Don't trip on the cords, and stay close to the side." I stare at him some more. Eventually I find words enough to let him know how hugely he's hooking a girl up and how grateful I am. I tell him I'll probably watch most of the show from up front, but I'll definitely come back for the last twenty minutes or so. Rhett does his solo set. I'm right up front again, despite my plans to hang back and have some pride (couldn't resist, glad I didn't). I'm watching Those Darlins when all of a sudden I feel someone step close behind me. I turn around and it's Ken, wearing a mischievous grin. He's come out and worked his way into the crowd to get up to the stage, where he can watch his own opening act. By now we're, like, familiar enough that he leans forward to talk in my ear and explain that he wants to surprise the girls onstage by being in the audience where they'll see him. I smile and nod and we squeeze around one another so he can have my closer spot. People around us are looking at this whole scene with curiosity, and I'm starting to feel like Pamela des Barres. Ken moves back behind me, but a few minutes later, I feel a tap on my shoulder. It's him again, and he asks if I'm at the show alone. I say yes. He sort of pushes a forty-something guy forward towards me and says, "Ellie, This is ___. I used to play baseball with him." "Baseball?" I inquire. He starts to answer then shakes his head. "Long story. Ask him." He leaves a minute later to get ready for the show. So now I'm hanging out with the baseball friend, who's actually never seen Ken play before, and in fact didn't even know who the Old 97's were when they became friends. He's a nice guy and we chat a little bit throughout the rest of Those Darlins. He says he'd been hanging out with Ken and the band on the tour bus beforehand, and I try to quell my inner teenager. When the Old 97's come on soon afterward, Ken charges immediately up to the edge of the stage, right above where baseball friend and I are standing, totally jamming and hamming it up for us. I'm laughing and yelling and loving it. The show is fantastic, and I love the set choices even more than the night before. Again, I'm a jumping, yelling, grinning, singing, dancing fool for two hours. When Rhett announces that they'll only be playing a few more songs, I slip through the crowd, show the guard my wristband, and go backstage. There's so much light on the stage - and the stage is so small - that I'm sure the entire audience can see me as I creep along the edge to join the sound guy. But they don't. A minute later, Rhett happens to turn towards stage left, notices me, and visibly reacts with a sort of surprised Oh, hey! smile. Visible enough that much of the audience turns my way to see what's he's looking at. 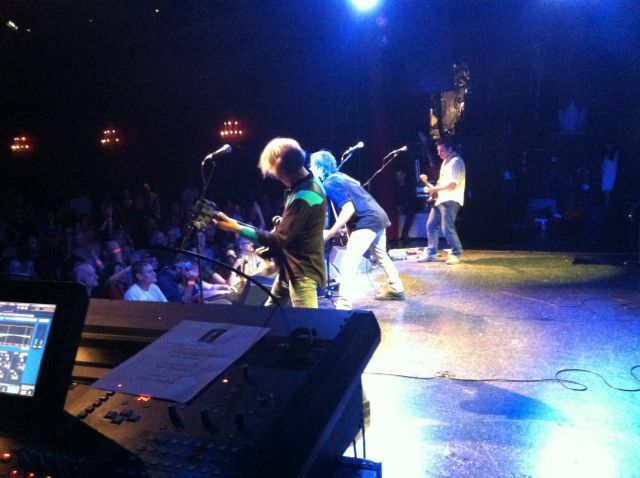 Only the front few rows can really see me in the dark, but I'm like, OH HAI OLD 97's FANZ. I'M ON STAGE STEALIN UR BANDZ FRENSHIP. So yeah, this is Surreal Moment Number Two. I haven't brought my Leica (part of the appeal of going back the second night was not messing about with a camera, and just enjoying the music), but I take a zillion blurry iPhone photos and two quick videos. When the curtain closes, I sort of hang back for a minute while the guys get rushed by - well, by I don't know who. More important people than me. I thank the sound guy profusely, eyeing the cluster around the band for a chance to break in and just shake Rhett's hand. I am determined not to leave without at least saying hello to this man. I shyly amble over and stand off to the side, feeling silly and in the way. But Ken sees me and very kindly steps over to engage me again, make small talk about the show, and just generally accommodate my dorkitude. Then, Surreal Moment Number Three happens. Rhett finishes his conversation with the woman he's been talking to, turns around, and sees me quite obviously waiting to meet him. A smile of recognition comes across his face, and he says, "Oh, hey there! Come here, I have to give you a hug. You're Ellie, right?" And then he hugs me. Can I just pause right here, to emphasize how amazing this moment was for me? Rhett Miller knew my name. Rhett Miller hugged me. 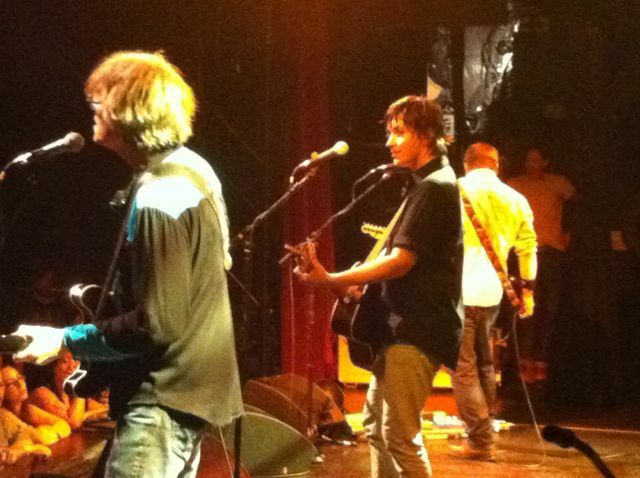 If you're not an Old 97's fan, I realize that this all means nothing to you. 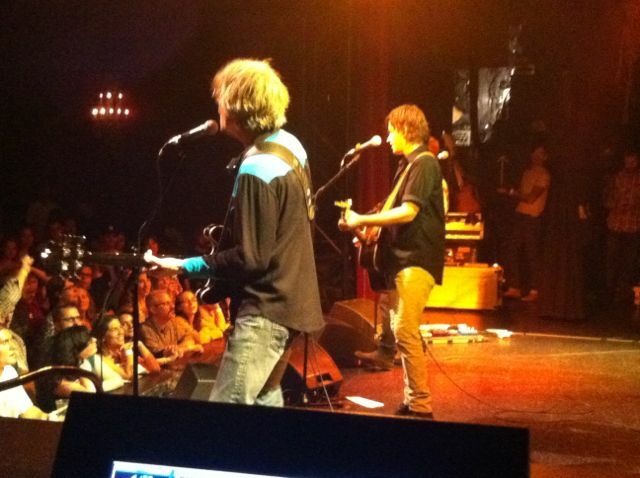 But substitute yourself for me and your favorite artist/celeb for Rhett Miller, and you'll understand how I felt. Talk about your Life Lists. And I know that I am not playing it cool at all, by making such a big deal of this and writing out all the details, but people, for me this was a HUGE deal. Of course, I blow my big moment to say whatever it is I would have wanted to say to my favorite musician of all time had I thought about it beforehand, and generally just stammer and thank him and get choked up like I'm going to cry. LOL. Whatever. I'll get it right in the next life. But Rhett is completely gracious, thanking me for coming to both shows and being so fun and making his night (I think he said something along those lines, though that could be wishful remembering, I was in shock). Then he steps off and I'm all of a sudden chatting to Ken Bethea again, because, hello? BFFs. I've deduced by now that Ken must have at some point and for some reason said my name to Rhett, in order for him to have known it. I'm guessing something like, Watch out for the rabid fangirl in the black dress. She looks like she might eat all of us if we're not nice to her. Her name is Ellie, in case you need to talk her down. Anyway, are you ready for Surreal Moment Number Four? I know; they're coming fast and furious at this point. Well, here it is: Ken says that his baseball friend and a few others are going to chill for a bit on the bus with the guys before they have to get going (they're playing the Fillmore in SF the next night), and would I like to join them?